Time of Origin: Originated from an alternate version of 1965; encountered The Doctor in Germany in 1944; began travelling with him after a meeting in Africa in 1951, ‘died’ in 2044. Appearances: "Colditz", "A Thousand Tiny Wings" to "Survival of the Fittest/Klein’s Story", "The Architects of History", "Persuasion", "Starlight Robbery", "Daleks Among Us", brief appearance in "That Time I Nearly Destroyed the World While Looking for a Dress". 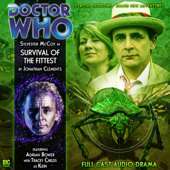 Doctors: Travelled for a time with the Seventh Doctor, she was acquainted with an alternate version of the Eighth Doctor. 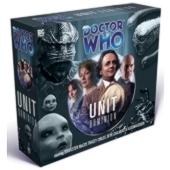 Companions: Attempted to use Ace as a hostage in her first meeting with The Doctor, had a brief encounter with a time-jumping Polly Wright (Although this encounter may have been erased). History: Klein is virtually unique in The Doctor’s history in that she has been both his companion and his enemy; while she was primarily motivated by her central goal to understand the secrets of the TARDIS and use them to restore her timeline where the Nazis won the Second World War, her initial actions upon meeting The Doctor were entirely beneficial to him, Klein aiding The Doctor more than once before she returned to her original mission and plans (Although there is evidence that she was merely waiting for her moment to put her plans into action rather than ever considering him a friend). In essence, her problem was that she possessed a mind that was simultaneously very open and exceptionally closed, willing to accept the existence of incredible alien technology but constantly hampered by her own perception and fixation in her belief that her timeline was the ‘correct’ one. According to all evidence, Klein was born to German parents but grew up in Britain, subsequently dealing with various examples of anti-German feeling during the war. As a result, she welcomed the Nazi victory in an alternate timeline created by The Doctor’s unintentional interference - although she, naturally, regarded this as the ‘true’ course of events - unconcerned about the fact that the only reason she had such an easy time of it was because she had blonde hair and blue eyes. In this version of history, the Nazis had won the war after learning how to use lasers to refine uranium based on their study of the CD Walkman belonging to the Seventh Doctor’s companion Ace, who had been killed during an escape attempt after the two accidentally materialised at Colditz Castle in 1944. Originally a research scientist at Cambridge, Klein was recruited by Captain Jonas Faber in 1962, who revealed the truth about previous contact with alien incursions, Klein’s role being to study alien technology and use it for the Reich’s benefit (Hitler had kept it locked away out of fear of the implications of superior intelligence, but his recent death had ended that restriction, although no definitive new leader had been established). Growing increasingly fascinated with the alien technology she discovered - particularly with her deep interest in temporal theory - as she and Faber became lovers, she learned of The Doctor’s role in the Reich’s victory by unintentionally providing them with laser technology, although Faber felt that the risks of time travel outweighed the benefits. Learning that The Doctor’s time machine had later been claimed by the Nazis when The Doctor returned in 1954 - The Doctor himself being shot and killed, although his body had vanished - Klein requested access to it, but was only able to enter the ship when the mysterious ‘Johann Schmidt’ contacted her with the news that he had the key to The Doctor’s machine, offering her his services in getting the machine working, although he was kept under armed guard due to his lack of a background. Eventually managing to access the ship’s flight log, Klein was inspired by a casual comment of Schmidt’s to travel back to Colditz in 1944 to question The Doctor directly about the ship’s operating systems before his death. Although Faber discovered Schmidt’s role in assisting political prisoners to escape, Klein nevertheless travelled back to Colditz, vowing that she would help Faber become the new Fuhrer. Unfortunately for Klein, she swiftly realised that things were not progressing as she had hoped. Although her forged identity papers proved sufficient to allow her to gain access to Colditz prison, subsequently taking charge of The Doctor and taking him back to ‘her’ TARDIS, she arrived in the forest where she had left the ship only to find that it had vanished, leaving no sign of its presence but an indentation in the ground that The Doctor easily recognised. Swiftly deducing that she came from an alternate future where the Nazis won the war, The Doctor nevertheless failed to convince Klein that her history was wrong, Klein arrogantly proclaiming her world as the better one, rejecting The Doctor’s attempts to convince her that her timeline was wrong while condemning his refusal to go back and fight for those who were enslaved by the British Empire while threatening to destroy her world. Although The Doctor managed to escape Klein, he failed to get back to Colditz before Ace was nearly executed in an escape attempt, only to learn that Ace had escaped execution by telling the guard that Klein - who had previously given orders to leave Ace unharmed as a bargaining-tool to be used against The Doctor – would be angry with him if she was killed, thus changing Klein’s history. Although Klein tried to regain her authority by informing The Doctor that she would have Ace shot at the first opportunity, her overconfidence caused her to slip up as she revealed that it was technology acquired from Ace’s confiscated backpack rather than technology from the TARDIS that gave the Nazis the edge in the war. While Klein’s deception was exposed, forcing her to flee, The Doctor rescued Ace and recovered her backpack before returning to the TARDIS. For a time after Klein’s escape from Colditz, The Doctor knew nothing about what had happened to her; she had a brief encounter with the First and Second Doctor’s old companion Polly Wright in the short story "That Time I Nearly Destroyed The World Whilst Looking For a Dress", but this was only a result of Polly having been sent ‘hopping’ around time by a mysterious entity that used her to cause rifts at crucial points in reality, the intervention of the Second Doctor apparently erasing this meeting from history as he helped Polly fight off the entity’s influence. It was later revealed that, after escaping Colditz and witnessing Germany’s defeat in the war, Klein had travelled to South America, joining the National Socialist group there for a time, even encountering Hans De Flores (Whom The Doctor would confront in "Silver Nemesis") and forming a high opinion of his abilities. Although she re-qualified as a physician during her time there out of a lack of anything else to do, Klein eventually relocated to Africa in the 1950s out of her old fascination with the continent. She eventually met The Doctor again during the Mau Mau uprising while staying in a house in Kenya, The Doctor had dropped in looking for a cup of sugar, although both admitted that neither of them had any doubts that they should meet again -, The Doctor and Klein investigating the strange death of one of the house residents and the discovery of a strange body with disjointed limbs, the two victims having been seemingly killed by something that left the bodies with thousands of tiny cuts. Although Klein still regarded her history as the ‘true’ course of events and defended the Third Reich’s actions in achieving conquest, she acknowledged that some of the scientists of her time had committed questionable actions even if she still defended their policies - claiming that Africa would descend into chaos with the British interest in negotiation as opposed to Germany’s decision to carpet-bomb the natives after they rebelled, The Doctor’s belief in the rights of the individual and the ability to find a less direct route conflicting with Klein’s view on the superiority of the state and the necessity of the more brutal course of action -, demonstrating a genuine affection and friendship for the people she was currently staying with. Based on Klein’s memories of a mysterious plague she had encountered in her original timeline - after assuring The Doctor that she had no interest in trying to use the plague for her own goals due to her inability to ‘aim’ it at specific enemies -, The Doctor and Klein were able to thwart an attempt by an alien scientist to develop biological weapons on Earth to sell to other races. With Klein’s only other option being to return to De Flores, The Doctor invited her to join him in the TARDIS, hoping that the sights he could show her in the wider universe would give her a wider perspective that would help her grow beyond her old boundaries and preconceived notions. 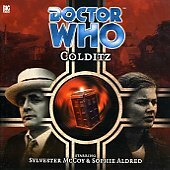 Unfortunately, The Doctor’s efforts were cut off before they could even begin when he was forced to reveal what had truly happened to him in Klein’s history when, while recounting her tale of how she had travelled back to Colditz in the first place, she remembered that Schmidt had referred to the TARDIS by name. In the original course of events, The Doctor had departed Colditz after Ace’s death before realising the implications of leaving her backpack behind, but, unable to interfere directly to correct his mistake, The Doctor instead landed the TARDIS in 1954, allowing himself to get shot by the Germans and the TARDIS claimed by their scientists before he regenerated in the morgue and escaped. With this new face, The Doctor infiltrated the Reich, spending the next decade helping political prisoners escape while waiting for the moment when someone would be given access to the TARDIS, subsequently contacting Klein and subtly guiding her to the right mindset to take the action he wanted and travel back to Colditz while programming the TARDIS to dematerialise after her arrival, confident that Klein would give his past self all the information he required to restore history to its proper course. Although Klein feigned acceptance of The Doctor’s perspective on events, it was nothing more than a ploy to buy her time to learn more about how to operate the ship herself, continuing to regard The Doctor as a hypocrite for destroying her history due to nothing but his own prejudices and leaving her to think that it had been her own fault. After visiting such diverse locations as the mercury swamps of Vulcan and the crystal plains of Mandroxia while in The Doctor’s company, The Doctor and Klein eventually arrived on a planet inhabited by an insectoid race known as the Vrill whose ‘Authority’ - the equivalent of a queen - had been killed during a recent attack. Although Klein was willing to help The Doctor protect the Vrill from a group of pirates attempt to harvest the Vrill nutrients for their own purposes - The Doctor even managing to devise a means of helping the Vrill create a new Authority -, The Doctor lost the TARDIS key while helping a warrior Vrill to hatch, Klein subsequently discovering the key and stealing the TARDIS to restore her history. As a result of Klein’s manipulations she created a reality where the Reich continued to exist as far into the future as 2044, the Reich now having expanded to include a Moonbase with an eco-bubble-generated atmosphere, as well as having developed spaceships based on salvaged Dalek technology with the intention of expanding the Reich’s influence to other planets. 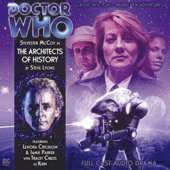 Although having assumed a role in this new timeline superficially similar to The Doctor’s in the true reality, Klein constantly interfered with this history to mould it the way she believed it should be rather than The Doctor simply interfering to help events play out as they should, even assuming the role of head of Temporal Affairs to the Reich, constantly erasing any attempts to subvert the Reich before they started by travelling back in time to prevent those events with knowledge from the future. Although seeing herself as the architect of a golden age where famine had been erased, a unified government had been created, and multiple invasions had been thwarted, Klein was nevertheless constantly aware that her new reality was still not her original one - the TARDIS having prevented her from going back and erasing her original mistake of listening to Schmidt in the first place -; even as she claimed that the new reality was ‘better’, she had never even gone to contact Jonas Faber despite her feelings for him, passing it off on the grounds that she would go back for him once her work was finished while secretly aware that it would never be the same if she did meet him again. Even those she claimed to serve were afraid of her, constantly worried that her contact with outsiders would eventually inspire her to turn on them, resulting in them insisting on her taking on ‘companions’ such as Major Richter to ensure she didn’t start rewriting their own histories to suit her goals, as well as teaching others to operate the TARDIS after her death. Her schemes eventually came to her head when The Doctor confronted her once more - his true memories still intact due to his status as a Time Lord -, his alternate self having providing Selachians from a century in the future with time-travel technology to allow them to attack the Moonbase while Rachel Cooper - the companion of the alternate Doctor - planted a device on Klein’s TARDIS that severed its connection to its interior, forcing Klein to turn to The Doctor. Although Klein mocked The Doctor for his alternate self’s willingness to resort to such ruthless measures as allying with the Selachians to achieve his goals - The Doctor forced to abandon the Moonbase to be destroyed when the Selachians revealed that they had reverse-engineered the technology he had provided for them to perfect time travel for themselves -, she admitted that she was almost relieved at the prospect of facing her ‘execution’, knowing that, no matter what changes she had made, the new timeline would never feel right.With Klein having been judged - most likely by the Time Lords - in her absence, she was sentenced to dematerialisation, being erased from existence completely, Klein accepting that sentence in the belief that it might restore her original timeline - despite The Doctor advising her that time was a self-correcting system that could simply replace her role during his experiences at Colditz with someone less dangerous -, although she apparently forced The Doctor to push the button that would dematerialise her himself to show that she was ‘correct’ about him. 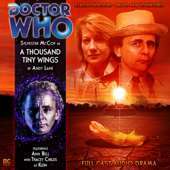 In the new timeline, Klein was employed by UNIT, using her talents to protect mankind, recalling various encounters with the Seventh Doctor from historical records (Including his visits to Colditz and Kenya), The Doctor paying the new Klein a brief visit after her other self’s erasure to confirm that history had been restored (Although the precise details of what he remembered about the timeline where he had travelled with Klein were unclear). Whether The Doctor shall have further contact with this ‘new’ Klein is currently unknown. Considering her complex relationship with The Doctor, it is somehow appropriate that Klein’s most memorable moment is the anomalous nature of her death. At the conclusion of her time with The Doctor, The Doctor had captured Klein and imprisoned her in an upgraded TARDIS designed to erase her from history to undo her changes to history. Although The Doctor expressed distaste at the idea of having to kill Klein in that manner, he also knew that he couldn’t let her live after her actions had caused so much destruction to history, culminating in him apparently ‘proving’ Klein right and pressing the button that would erase her from history ("The Architects of History").